Now that is really funny!!! No, and puddin has a taser! I love them! They are so quick too. They are a strong team and i'm glad they stayed for leg 1!! Yeah, so am I! That was certainly a close one, but for not giving up when they were so far behind alone, they deserved to make it to the next leg over Preston & Jennifer! It's kind of surprising, though, that they went from first place due to something train-related to last place from something else train-related. Still, glad they're still with us another week! Do you think they have an advantage of carrying a trolley bag instead of a backpack ? Their trolley bag turns into a backpack when needed, I love it! And I thought they were awesome with the cheese! They made up a lot of time there! Love these ladies, can't wait to see more! Before the premier, they were my least fave all-female team. Now they're in fact on-par with the other 2.. just that there's no space in my banner to include yet another team. She and teammate Jodi Wincheski of Houston, both flight attendants for Southwest Airlines, started off strong, reaching the race’s first destination — Locarno, Switzlerland — in first place. But they were in sixth place when they reached the first road block — a bungee jump off Verzasca Dam, which Jodi did while Christie cried nervously — and they were the last to complete the task of transporting 200 pounds of cheese down a hill at Kleine Rugen Weise. But they knew what to do to stay in the race, and that was run as fast as they could in the final stretch to the pit stop in Stechelberg. They finished about 10 paces ahead of Preston and Jennifer from Columbia, S.C.
Christie also knows what attracts viewers to “The Amazing Race,” which has won all six Emmy Awards handed out for outstanding reality-competition program. “I see people come on (the plane) and they are stressed to the max,” she said. “By the time they check in at the gate, go through security, then are selected to do more security, they’re frustrated, they’re running late and they’re at each other’s throats. And they’re going on vacation. They’re supposed to be happy. Competitors on the hit CBS show "The Amazing Race" are always surprised to find out where they're headed next. But one of this season's contestants knows just where she'll be Sunday -- her hometown, Salem. Jodi Wincheski is among the cast in the 14th season of the Emmy-winning show, in which teams compete to arrive first at round-the-world destinations and to complete various tasks. Wincheski will be in Salem to gather with family and friends for a public viewing party of the third episode of this edition of "The Amazing Race." It's a homecoming for Wincheski, who grew up in Salem and graduated from South Salem High School in 1986. Though she now lives in Houston, Wincheski follows in the footsteps of Oregonians Anita and Arthur Jones, the Eugene couple who competed on the 13th season of "The Amazing Race." Under CBS rules, Wincheski can't talk about the show until or unless she's eliminated. But her father, Ned Kanoff, recalls that his daughter got an early start on traveling. "I was working in Alaska back then," recalls Kanoff, who now lives in Stayton. "So she was born in Salem, but we took her to Alaska when she was an infant. She's been flying for a lot of years." Wincheski continues to rack up air miles, not only on "The Amazing Race" but as a flight attendant. Her teammate on the show is a fellow flight attendant, Christie Volkmer. A divorced, single mother, Wincheski has said she wanted to compete on "The Amazing Race" as an example for her daughter about the power of pursuing your goals. So far, it's been a challenge. On the first episode alone, Wincheski flew to Zurich, Switzerland; took a train to Locarno, Switzerland; performed a 70-story bungee jump; and transported 50-pound wheels of cheese down a steep, slippery hillside. Wincheski and her teammate finished second from the bottom on the first episode, and again on the second episode. Will they survive the third episode? Viewers will learn the answer Sunday night. No matter what happens, Ned Kanoff says his daughter is a natural-born Amazing Racer. "It didn't surprise me at all that she would want to get on a show like that," Kanoff says. "Jodi has always been real competitive." 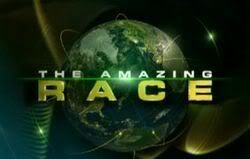 "The Amazing Race" airs at 8 p.m. Sunday on KOIN (6). The public viewing party is at Top Dog Sports Bar & Grill, 1798 12th St. S.E., Salem, 503-586-0245. Hmm. Going to a hometown viewing party? Wonder if it's because she and Christie get eliminated this Sunday? Doesn't mean anything. Kynt & Vxysin held viewing parties throughout TAR12. Good luck Christie and Jodi! Happy RACE DAY! I'm glad they made it. I hope they can make it past the Speed Bump next week, though. Best team of the season... for me anyways. I shall miss them racing! Same feeling here, hakushu8, they will be missed. I hope they decided to have a viewing party here in BigD before the season is over. I know they are here a lot, being SWA FA's. I'll miss them. If that horrible driver of theirs hadn't stopped for gas, they'd have beaten Mark & Michael despite their Speed Bump. I'll definitely miss Christie & Jodi. Very tenacious racers and were always fighting to the end. Never gave up and always had hope to the end. I will miss them a lot. They were Team Perseverence for this season. Now we have to watch Mark & Michael copy Dandrew even more. Mark and Mike for the Boot next! Prepare to hate him even more. He also drove a half-hour in the wrong direction right out of the airport, and that was in addition to him having to stop for gas. Jodi said as much in a post-show interview.